Work injuries can lead to reduced performance during everyday activities, compromise your ability to work, and cause physical as well as emotional pain. Though certain medication may help to mask the pain, medication alone will not address the symptoms. 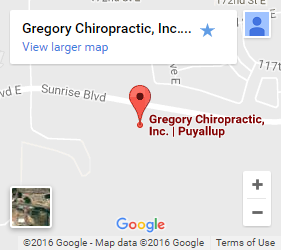 A work injury chiropractor in South Hill with Gregory Chiropractic can help you recover and achieve long-term pain relief. Manual adjustments and motion therapy – When you suffer from a work-related accident, damage can have a negative impact on your range of motion. Falls frequently cause spinal and neck injuries, and lower back pain from desk jobs is common. Adjustments put the spine pack into alignment, and motion therapies involve stretching specific muscle groups that can help free tightened muscles and restore full mobility. Exercise therapy – Rehabilitation involving exercise therapy works on two levels. It helps to strengthen and stretch weakened muscle groups, and also helps to prevent damage from occurring in the future. This provides relief and acts as a preventative measure by increasing tolerance levels for muscle fibers and reducing the likelihood of tearing. Massage therapy – Our massage therapists are skilled in a variety of different massage techniques. Depending on the nature of the injury we may recommend medicinal, deep tissue, swedish, or another type of massage therapy. We’ll tailor your massage to your diagnosis to provide targeted relief from pain. Our chiropractic clinic offers the care you need for long-term recovery. A work injury isn’t a life sentence. Call or contact us today.